Your search for the perfect bass line never ends. 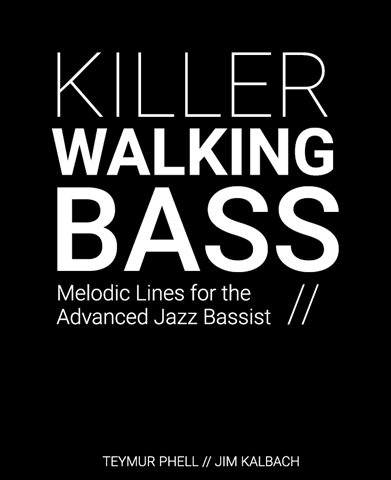 Expand your style with Killer Walking Bass. This bass book is unique. We focus on melody as a key driver in walking. Avoid playing the same thing over and over. Improve your bass playing and add to your vocabulary now. Get ready to be inspired, whether an advanced bassist or intermediate jazz bass player. Take your walking to the next level. Teymur is a virtuoso bassist, proficient in classical, upright jazz and electric bass styles. He graduated with honors from the Jerusalem Academy of Music, where he studied with bass professor Dr. Michael Klinghoffer. In 2010, Teymur moved to New York City and quickly became a sought-after bassist. He’s performed with Mike Stern, Arturo Sandoval, Vic Juris, Oz Noy, Lafayette Harris, and others. Find out more about Teymur on his official site. Jim a has a degree in music from Rutgers University, where he studied composition with Charles Wuorinen. Check out Jim’s composed bass melody over the changes of “All Of The Things You Are,” intended to be bowed but also playable pizzicato. Get our Merch at CafePress!